How can I use the equilateral triangle calculator? 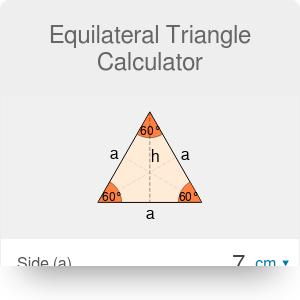 The equilateral triangle calculator will help you with calculations of the regular triangle parameters. Whether you are looking for the equilateral triangle area, its height, perimeter, circumradius or inradius, this great tool is a safe bet. Scroll down to read more about useful formulas and to get to know what is an equilateral triangle. The equilateral triangle, also called a regular triangle, is a triangle with all three sides equal. What are the other important properties of that specific regular shape? the altitudes, the angle bisectors, the perpendicular bisectors and the medians coincide. The equilateral triangle is a special case of an isosceles triangle having not just two, but all three sides equal. h = a * √3 / 2, where a is a side of the triangle. But do you know where the formulas come from? You can find them in at least two ways: deriving from Pythagorean theorem or using trigonometry. Height of the equilateral triangle is splitting the equilateral triangle into two right triangles. One leg of that right triangle is equal to height, other leg is half of the side, and the hypotenuse is the equilateral triangle side. How to find the radius of the circle circumscribing the three vertices and the inscribed circle radius? Let's take the example from everyday life: we want to find all the parameters of the yield sign. Type the given value into right box. Assume we have the sign with 36 in side length. Check out our tool flexibility. Refresh the calculator, and type in the other parameter, e.g. perimeter. It's working this way as well, isn't that cool? Equilateral Triangle Calculator can be embedded on your website to enrich the content you wrote and make it easier for your visitors to understand your message.